Also this year, the RISEBA University supported the international media camp “Young Media Sharks” by providing technical equipment for the participants. 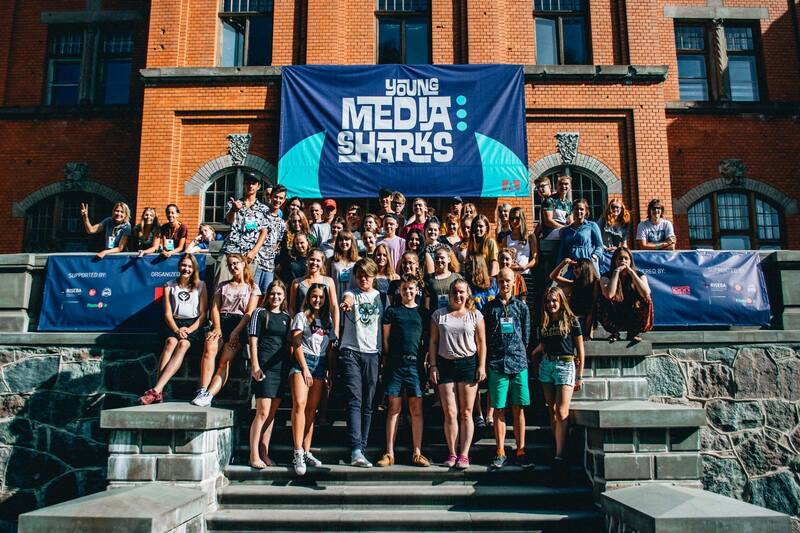 At the beginning of August the annual media camp “Young Media Sharks” took place, in which 48 youths from Latvia and Lithuania developed media content ideas which would help solve various issues. Ideas for new television shows on various socially relevant issues were generated, as well as inspiring and innovative application ideas in the fields of tourism, education and entertainment. The RISEBA University provided the camp participants with Macintosh computers with the necessary programs for photo and video editing, as well as filming equipment to help with practical work. During the week, various representatives of the creative industries helped the youths learn more about the media world – journalism, the art of photo and video, the art of debating, as well as other relevant skills. Among them was Aigars Ceplītis, the creative director of the Bachelor’s and Master’s programme for RISEBA Media and communication study faculty, who told the participants of the camp about his extensive experience. A collection of short films by the University students was also demonstrated during the camp. It was created by RISEBA’s audiovisual media art students during their study process. The RISEBA University is also happy to see such energetic, creative and capable youths among their students. The camp “Young Media Sharks” is organised every year by the association “Avantis”.